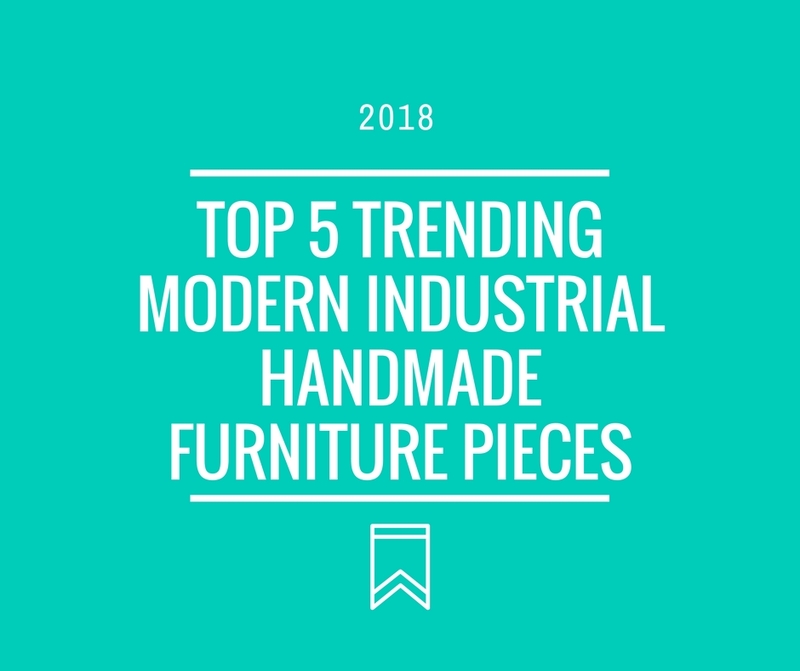 Inspired by the clean, streamlined aesthetic of urban living, modern industrial furniture has become a popular interior design choice for many. Harking back to the ideals of the great mid-century designers influenced by a post-war world during which efficiency was integral, the modern industrial composition is built-to-last and is uncomplicated in its minimal form. At Olde Good Things, repurposed wood is salvaged and given new life in our modern collection. 1. Four Seat Swing Seat Industrial Factory Table – Available in 4, 6, 8 & 10 seats. 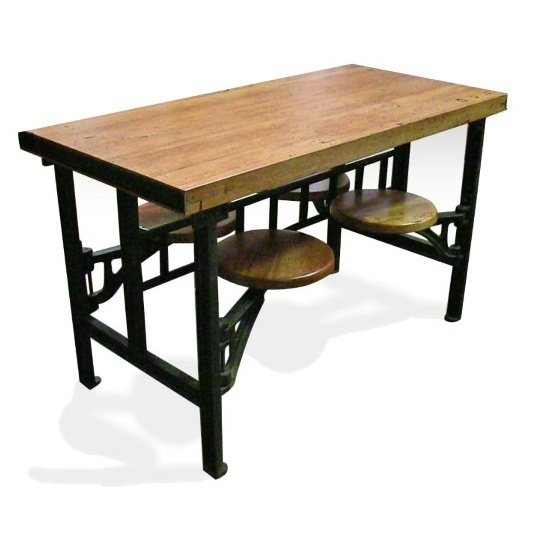 This style of base was typically used in a factory setting as an assembly line or cafeteria table in the early 1900s. The top is reclaimed butcher block and the round seats are hard maple. You can customize the type of wood top & stain. The base has been replicated from an original set we salvaged from a factory in 2015. 2. 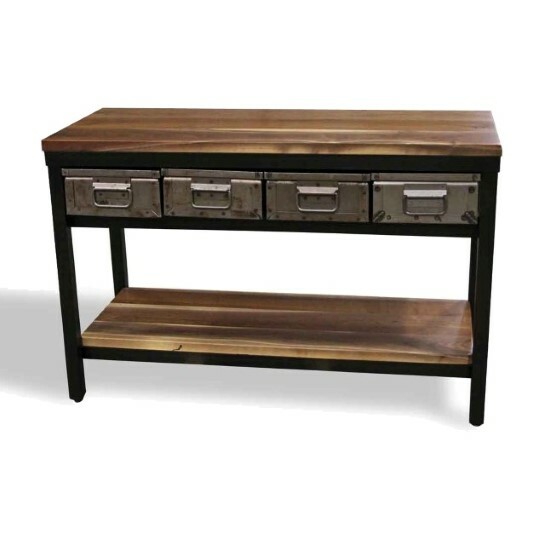 Walnut Console Table with Four Steel Drawers – Custom sizes & other wood & stain options are available. Please allow 6-8 weeks for completion. Made to order. 3. 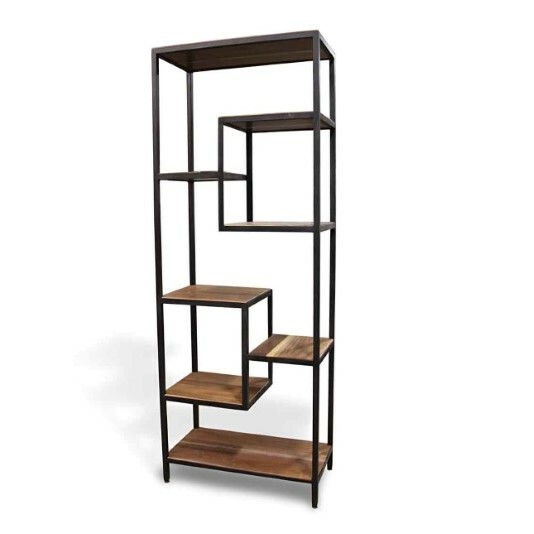 Handmade Walnut & Black Steel Modern Shelf – Handmade shelving unit by the artisans at Olde Good Things. We built these shelves using sustainable wood materials and angle iron. These units are a tall and narrow size, which are perfect for a small area in a room. Overall size, wood type and shelf count can be customize, please inquire for pricing. Please allow 6-8 weeks for completion. Made to order. 4. 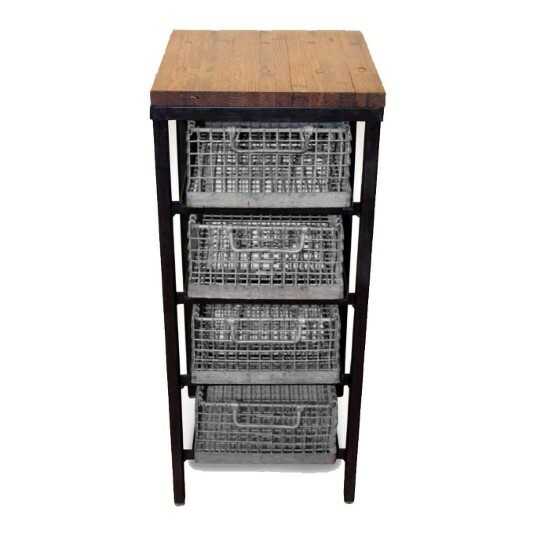 Four Tier Galvanized Basket Stand – A reclaimed industrial wood top finishes this handy four tier basket storage stand. Great for kitchens, bath or as a side table. 5. 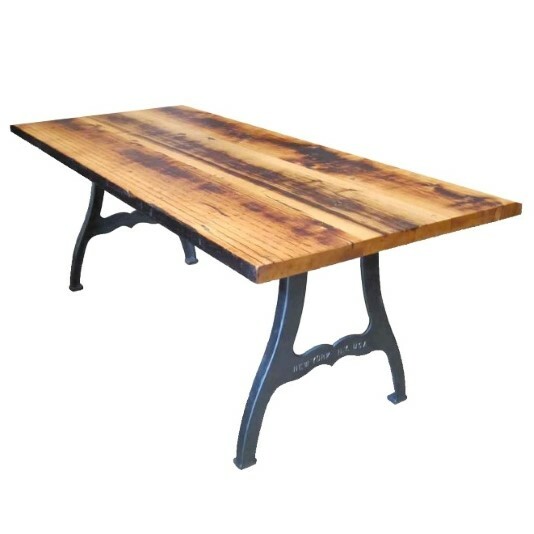 Reclaimed Farm Table with New York Machine Legs – An Industrial combination of reclaimed pine wood from New York City building beams and replica salvaged industrial machine legs makes a unique dining room table for your workspace. Marine spar varnish and oil finish. The legs can be painted with a faux antique finish in any color. Please allow 6-8 weeks for table completion. Made to order. Modern furniture continues to evolve in its definition and as it does, Olde Good Things is honored to partake of its development. Some of our customers have approached us with specific visions to be precisely hand-crafted by our team while others have come in with a vague concept and an open mind. Working with our customers allows for us to get a better feel as the progressive perspective and helps for us to grow and create new and compelling designs. Hi there. We ordered a custom made bowling alley coffee table from you guys back in the winter or fall. It’s wonderful. Do you do custom orders for barter countertops? We have a butcher Block idea but it requires a unique shape or cut to the bar top. I can provide more details if this something you would do. Please contact [email protected] attention Andrew with your proposal. Thanks for sharing this blog!! I was thinking about buying a wooden furniture for my open cafe. And I really liked the concept of ‘Four Seat Swing Seat Industrial Factory Table’. If I customized this table for my cafe what kind of wood should I use?? The hardwood, softwood or the engineered wood?? Oak & Maple are good hardwoods to use. Our rustic pine tops are popular in a restaurant setting. You can email [email protected] for anymore further questions.